Storefront’s Critical Halloween Party Bibliography is a compilation of readings that acts as a resource for individuals interested in investigating the topic of each year’s Critical Halloween event. The bibliography for this year’s theme of “LUXURY” focuses in particular on issues of desire, excess, and aspirations of fairness. Luxury can carry fluctuating pejorative and covetous connotations. With this bibliography, we collect existing philosophies, ideologies, and knowledge in the archives of history through a series of texts that sheds light upon the articulation of thoughts, costumes, and critique. To submit your own contributions to the bibliography ON LUXURY, send an email with citations to info@storefrontnews.org. Appadurai, Arjun. “The Social Life of Things : Commodities In Cultural Perspective.” Cambridge: Cambridge University Press, 1986. Berry, Christopher J. 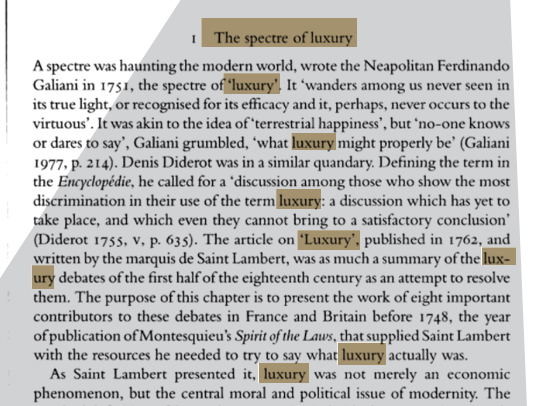 The Idea of Luxury: A Conceptual and Historical Investigation. Cambridge University Press, 1994. Bourdieu, Pierre. “Distinction: a Social Critique of the Judgement of Taste”. Cambridge, Mass. : Harvard University Press, 1984. Brewer, John and Roy Porter, eds., Consumption and the World of Goods. London: Routledge, 1993. Brucken, Carolyn E. Consuming Luxury: Hotels and the Rise of the Middle-Class Public Space, 1825-1860. George Washington University, 1997. Burke, Timothy. “Lifebuoy Men, Lux Women : Commodification, Consumption, and Cleanliness In Modern Zimbabwe.” Durham, NC: Duke University Press, 1996. Condello, Annette. The Architecture of Luxury. Farnham: Ashgate, 2014. Dalby, Andrew. Empire of Pleasures: Luxury and Indulgence in the Roman World. London and New York: Routledge, 2000. Frank, Robert H. “Luxury Fever : Why Money Fails to Satisfy In an Era of Excess.” New York, NY: Free Press, 1999. Galbraith, John Kenneth. ”The Affluent Society.” Boston: Houghton Mifflin, 1998 . Hoffman, Jonas and Ivan Coste-Manière. Global Luxury Trends: Innovative Strategies for Emerging Markets. Palgrave Macmillan, 2013. Mark Goldie and Robert Wokler. Cambridge University Press, 2006. Kastner, Olga Louisa. When Luxury Meets Art: Forms of Collaboration between Luxury Brands and the Arts. Berlin: Springer Gabler, 2014. Marx, Karl. Capital: A Critique of Political Economy. Moscow: Progress Publishers. English, 1886. Maxine Berg and Elizabeth Eger, ed. Luxury in the Eighteenth Century: Debates, Desires and Delectable Goods. New York: Palgrave Macmillan 2003. Miller, Daniel. “Stuff.” Cambridge: Polity Press, 2010. Sekora, John. Luxury: The Concept in Western Thought, Eden to Smollett. Johns Hopkins University Press, 1977. Sombart, Werner. Luxury and Capitalism. Ann Arbor: University of Michigan, 1967. Thomas, Dana. Deluxe: How Luxury Lost Its Luster. Penguin, 2007. Thomson, David. Renaissance Architecture: Critics, Patrons, Luxury. Manchester University Press, 1993. Thorstein Veblen, The Theory of the Leisure Class, An Economic Study of Institutions. New York, 1899. Voltaire, “Luxury.” A Philosophical Dictionary, Volume 3. London: Hunt, 1824.